Ends the age of fear. He thinks it was revenge. Revenge for breaking my heart. Does he not know that a broken heart stems from love? Does he not know me at all after all this time? It us only important whether or not I could have forgiven myself for standing by, watching, an not doing anything to prevent any more heartache. It was for her. It was because I saw someone getting the crap beat out of them every day, by a lie they were unaware of that was growing daily. How do you stand by, when you see someone getting set up for the kill, against their own wishes, and do nothing? It was for her Scott. It wasn’t about you. You devastate me, and then wouldn’t let me go. As the weeks went on, I saw what you were doing to her. You were still telling me you didn’t want a loving relationship. She obviously thought she was in one. She had no idea, none, that daily you were laughing inside, as you tried to get me to see you Sundays, Wednesdays. And if it wasn’t me, because it wasn’t, soon enough it would have been Samantha, or someone. Because you don’t know why you can’t have whoever you want whenever you want. Your dream, to have a different woman every night of the week. Your fantasy. Her fantasy and mine, to have a man who loved them, and was faithful to them, and building something that bordered on miraculous. It was for her. I couldn’t stand by and watch you play with someone else the way you did with me. I couldn’t watch as you set someone else up for a fatal blow at a time of your choosing. You know I cannot remain silent, and watch someone get hurt. If you don’t know that about me, it’s because you didn’t pay any attention, you just took what you could from me. I told you, if you want to be loved, then be lovable. Your actions are not separate from the person that you are, they are a physical manifestation of who you are. Who you are, right now, is not lovable, because you used two women for your own purposes, oblivious to the pain you would cause. I told you to stop acting wounded. You have no idea what a wound is. You didn’t love either one of us. You are incapable of loving someone. You are only capable of stealing from them, to bolster the empty hole that is your heart. Stealing their pure love, their energy, their lives, so that you can believe you are valuable because these two women love you. I have told you 100 times, I saw your soul. Maybe 1000. You know it was true, you know I knew things about you I shouldn’t have known because you didn’t tell me. I told you your value is within. Find it. Take this time and find it. Stop leaching off of me and her. It doesn’t matter what happened to you when you were a child. It doesn’t matter what you did yesterday. It matters what you choose to do today. Try loving yourself, enough to acknowledge who you have been, and to try to be the person you want to be. The person you think you are when one of us took you to our bed and adored you. We deserved to be adored back. It was for her. It was never about you. You and only you are responsible for your life. It was lovely to get away for a few days. Especially to a place so beautiful, so remote. My friend is involved with so much in her extended community. Her little village has 90 year round residents. One up the road has 1000, in the other direction there is a little town of about 2,000 or 3,000. The schools are all consolidated, and include kids as far as Lake Placid, 70 miles away. My friend taught music to almost every kid in 50-70 mile radius that lived there year round. Of course, these numbers go way up in the summer. Cool there in the evening and the morning, up to maybe 80°F during the day. Because of this, she knew someone everywhere we went. In Lake Placid, she was friends with the docent at the hockey rink.. We ran into other folks who recognized her on site. She took me for a brunch cruise on one of the lakes that has 99 miles of shoreline. She and her husband took me to a play of local and some Broadway actors who live in the area in the summer. It was all really wonderful. Then, of course Lake Placid, was just a little story book village. When the Olympics were held there they did not level part of the town to build the facilities. They put them where they would fit, and didn’t destroy the magic of that wonderful little village. For instance, the high school is directly across the street from the hockey rink. And at the bottom of the front steps is the speed skating oval where Eric Heiden won 5 Olympic gold medals. I kept saying I can’t imagine how motivating it would be to go to high school with those facilities as part your daily life. (The Lake Placid high school hockey team won their championship in 1980….) You can stand on the hill and see the ski jumps, which kids were practicing their arrial jumps on, landing in a pool. The toboggan run is a water slide in the summer ending in Mirror Lake. Of course, the hockey rink was a huge deal for me. I was texting pictures to my son from there, he was texting back “I’m so jealous!” The town still has Miracle on Ice memorabilia all over town, the names of each player on the team are on the walls of the rink. My shock was what a small venue it was, maybe 5000 people could fit in there. But then, that was the year, and the game, that changed the face of the Olympics. I was standing there, in the rink, and could almost hear the chant “USA USA USA USA”. I remember watching the game back then at home, on TV, and it was just awesome to be there 35 years later, as a hockey mom whose kid played for so many years. We also saw the 1932 Olympic rink. It had so few seats, it was quite comparable to rinks my son played at. We did some souvenir shopping, had lunch. The surroundings are beautiful, that part of the Adirondacks, near Lake Placid are called the High Peaks, which include Whiteface Mountain. That ski resort was the site of the Olympic skiing that year, and is visible from anywhere in town. Then we drove back to their beautiful little village, and had dinner. We reminisced a lot, got caught up. Her husband is a great guy, I had only met him briefly once before. But he has a great sense of humor, a little off beat, he can make me laugh, and anyone who can make me laugh is a special. He ad my friend have a great marriage, calm, happy, live and let live, while caring deeply for each other. It was a good place to get rested up, (I slept 7 or 8 hours every night) and try to figure my own stuff out. I texted and talked to S while I was there. I am still making no predictions for us. He may come here tonight…but then again, I told him if he still has the feeling that he might want to date other women he will be disappointed if he comes. So…I don’t know. I’d love to see him, but I’m not gonna set myself up for another heart break. I hope he gets it…. I friggin love that man. Every time I go away, I end up realizing how much I care for him. Every single time. So I need to somehow figure out how to protect my heart, and follow it. Talk about a minefield. At least I cut A loose, because he was a distraction from what i need to deal with. I have not heard from him since Friday. We had no unkind words, but I’m not going to initiate communication with him, because it’s really better for me and for him, to end it if I have no intention. He jumped way ahead, making assumptions that he didn’t know to be true, and then making plans based on them. He and S are on the opposite ends of that spectrum, S hates making plans even a few days in advance. I wish there was a happy medium. So.. life goes on. No resolutions, but the conversation has turned caring and kind and flirty, instead of angry, and hurtful. Just trying to stay with it. Last night I was surfing the channels on TV, tired, unstressed, kind of wanted maybe a chick flick or something. 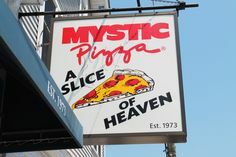 I stumbled onto Mystic Pizza. It’s kind of a classic, Julia Roberts got her start. Mystic is about an hour from where I live, I’ve been there many times and I like watching movies where I recognize the scenery. So that’s what I watched. In this case, as the movie went on, I thought, maybe not such a good idea. Mystic is also a place I went with S, on our excursions. It is on the CT shoreline, where I had wanted to spend the day yesterday but couldn’t. But the thing that really got me was the 3 girls and their relationships, all the kissing. S did not like kiissing, and rarely did more than a quick kiss goodbye. It was seriously withheld after our first date, and I think the idea, the implied promise, that it may happen again kept me hanging on. Thus, my poem last night, Just a Kiss. Of course, until I realized it just kept getting farther away, and finally, that it was never going to happen again. He got what he wanted from me, there was no need to give me more. He wasn’t feeling it, he didn’t want to feel it, and I no longer craved it from him. I just wanted to be free to find it. By the end of the movie, I was just glad that I no longer felt the desire to have it from him, nor did I have the desire to interact at all with him. I’m so glad I cut off communication by blocking him on my phone, it has helped me regain my equilibrium. He can call and leave a voice mail, but I am not even checking to see if he did. I don’t want to know. I hope he has not, I hope he has respected my request to not try to communicate with me. It’s funny, too, how my carpal tunnel the last few nights has not been nearly as painful. My cousin told me that when the right arm has pain it’s from too much giving. I’ve stopped giving to him, and my arm is much better at night. It still hurts, I will still get the surgery, but it’s so nice not to wake up with shooting pains in it, like someone is sticking a hot poker down my arm, and my hands and fingers aching and throbbing. Something to be said for the emotional component of all physical issues, isn’t there? I guess that pain, like all the other from this difficult relationship, is receding.